2007 the Copenhagen Hospital Biobank. samples from >306,000 individual patients. Others: The PERSIMUNE biobank, The Danish HIV Cohort Biobank, The Danish Cancer Biobank and The Danish Rheumatology Biobank. 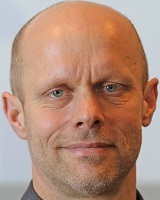 Head of The Virology Section at Department of Clinical immunology, Rigshospspitalet. Focuses on blood donor health studied within The Danish Blood Donor Study. A main area of focus is iron metabolism and causes and consequences of iron deficiency. In collaboration with deCODE genetics participants are being genotyped to study genetic components of: healthy ageing, infections, iron homeostasis, anemia, ADHD, depression, asthma, allergy, inflammatory skin- and rheumatic diseases, RLS, headache, migraine and bleeding disturbances. Included in the study is a large biobank of consecutive plasma samples ideal for identification of early disease markers.